Well here is the latest information I have found out regarding the relaunching of The Odyssey Channel. To begin with, Hallmark Entertainment has begun production on a preschool computer-animated series that will premiere on the new Odyssey Channel in January 2000. The company is also developing several original movies that will be showcased as part of a monthly event on the network beginning this fall. Meanwhile, two original family series are being produced by The Jim Henson Company for Odyssey, one of which will kick off this fall with a two-hour pilot movie for the early evening series. The Jim Henson Company is also producing a new version of the PBS daytime how-to series "Donna's Day" and is developing a series starring Louie Anderson for Odyssey next year. Hallmark and Henson are the new partners of Odyssey, which was to be relaunched April 4. That date has been pushed back until the fall. A new schedule featuring programs from Henson and Hallmark libraries such as Hallmark's Emmy-winning NBC miniseries "Gulliver's Travels," "The Muppet Show" and "Lonesome Dove" will be added to the lineup as of April 4. Margaret Loesch, Odyssey president and CEO, has said that there was not enough time since she took over in November to rebuild the program schedule and produce the mix of original programming that the network plans to add late this year and early next year. April 4 will now be used as a "soft launch" that will begin the process of blending henson/Hallmark libraries with the religious programming of the National Interfaith Cable Coalition, another of the network's owners and eventually the original programming. The new on-air look and logos will be introduced in the fall. Odyssey will limit commercial time to 10 minutes per hour. The four-hour "Gulliver's Travels" miniseries will premiere at 6:00 p.m. April 4 as a special event with an intermission. A block of family movies at 7:00pm weeknights and more adult-oriented family movies at 9:00pm will include Henson theatrical films such as "Labyrinth" and "The Dark Crystal." Other Henson off-network movies and miniseries planned for the near future include "Scarlett," "Gypsy," "The Odyssey" and the CBS movie "Titanic." Hallmark Hall of Fame movies to be shown include "What the Deaf Man Heard" and "The Piano Lesson." 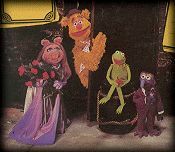 Brian Henson will host newly produced interstitial segments for reruns of "The Muppet Show" at 6:00 pm weekdays that will feature behind-the-scenes information and anecdotes about the series. Other Henson series such as "The Storyteller" and "Muppet Classic Theatre" will be presented at 7:00 pm Saturdays under the "Jim Henson Presents" banner. The network's daytime and weekend lineup will feature the live and animated versions of "Fraggle Rock" and the animated "Muppet Babies." The 1994 syndicated series "Lonesome Dove: The Series" will be shown weeknights at 11:00pm and the original two CBS miniseries on which the series was based will also be shown on Odyssey. In addition, Odyssey has acquired programming including reruns of TV series such as "Trapper John, M.D." "Zoobiliee Zoo," "Archies," "Davey and Goliath" and the cable premiere of "Alf." Selected films and shorts from the Hal Roach library will be shown at 4:00pm weekdays under the "Leonard Maltin Presents" banner, with Maltin introducing classics from Laurel and Hardy, Our Gang and the Little Rascals. Odyssey will maintain a significant schedule of "faith and values" programming on Sunday mornings and afternoons.